Break down redirects here. 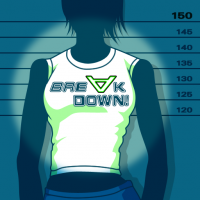 For other songs titled Break Down, please see Break Down (disambiguation). BRE∀K DOWN! 's pop'n music banner, as of pop'n music 16.
konna hibi furikitte ima sugu tobidasou!! honto no ashita sagashidaseru made! A re-arrangement of BRE∀K DOWN!, titled BRE∀K DOWN! (GF&DM STYLE), can be found in GUITARFREAKS 8thMIX & drummania 7thMIX. A long version of BRE∀K DOWN!, titled BRE∀K DOWN! (Full Version), can be found on the GUITARFREAKS & drummania BEST TRACKS soundtrack. A re-arranged long version of BRE∀K DOWN!, titled BRE∀K DOWN! (LIVE BAND style), can be found on BeForU's self-titled first album. An English cover of BRE∀K DOWN! by NAOKI presents WORLD WIDE STYLE, titled BREAK DOWN! (World Version), is available on the KONAMI♪MUSICフル service. This version features vocals by Alison Wade. A short version of BREAK DOWN! (World Version) can be found in DanceDanceRevolution HOTTEST PARTY. The artist was changed to ELE ROCKS. BRE∀K DOWN! 's pop'n music 10-15 banner. BRE∀K DOWN! received a Single BEGINNER chart in DanceDanceRevolution EXTREME. BRE∀K DOWN! could be unlocked to pop'n music 9 from April 2nd, 2003 to April 4th, 2003 via ee'MALL. It was later added to pop'n music 9 on April 24th, 2003 via ee'MALL. Before the 2004.03.23 version of ee'MALL 2nd avenue, BRE∀K DOWN! 's banner displayed BRE∀K DOWN as the title instead of BRE∀K DOWN!. As such, pop'n music 9 is the only game that remained without the change on the banner. Before the 2004.03.23 version of ee'MALL 2nd avenue, BRE∀K DOWN! 's Music Comment displayed that BRE∀K DOWN! was originally from GUITARFREAKS 8thMIX & drummania 7thMIX. Since the 2004.03.23 version, the Music Comment displays that BRE∀K DOWN! is originally from DDRMAX2. However, the preview music of BRE∀K DOWN! still uses the GF&DM STYLE version of the song. Before the 2004.03.23 version of ee'MALL 2nd avenue, BRE∀K DOWN! 's songwheel genre was BREAK DOWN. Before pop'n music 12 いろは, BRE∀K DOWN! 's songwheel genre was BREAK DOWN!. Before pop'n music 14 FEVER!, BRE∀K DOWN! 's songwheel genre was BRE∀K DOWN!. Along with 祭 JAPAN, BRE∀K DOWN! is one of the two ee'MALL DanceDanceRevolution songs that were given brand new keysounds in pop'n music, unlike other crossovers which recycled their beatmania IIDX keysounds. BRE∀K DOWN! received a Double BEGINNER chart in DanceDanceRevolution ULTRAMIX3. Before DanceDanceRevolution SuperNOVA, BRE∀K DOWN! was credited to Be For U.
BRE∀K DOWN! is one of the BeForU songs revived in pop'n music 19 TUNE STREET from their previous removal in pop'n music 17 THE MOVIE, along with GRADUATION ～それぞれの明日～, CANDY♥, and ☆shining☆. BRE∀K DOWN! was still present in the location test of DanceDanceRevolution X, with its new foot ratings. BRE∀K DOWN! is one of the unlockable revivals in DanceDanceRevolution X2. It can be unlocked by reaching ENJOY LEVEL 30. As of February 23rd, 2011, BRE∀K DOWN! has been unlocked for normal play. In DanceDanceRevolution Classroom Edition, BRE∀K DOWN! 's title was misspelt as BREVK DOWN!. BRE∀K DOWN! was performed on the RIYU KOSAKA FIRST LIVE at O-EAST 2005 and BeForU LIVE 2006 concerts. BRE∀K DOWN! appears on the movie La máquina de bailar. BRE∀K DOWN! was supposed to appear in the cancelled game カラオケレボリューション BEMANIシリーズセレクション. "BREAK DOWN" by Be For U is the latest song from the same group behind "DIVE." Fans of Japanese pop will surely be getting down with "BREAK DOWN". Check out the other song from Be For U in this game as well. This page was last edited on 1 April 2019, at 12:39.